Ace stock market investor Rakesh Jhunjhunwala has increased his stake in casino and hotel operator Delta Corp Ltd to over 10%, following fresh share purchases on Thursday, showed bulk deal data by stock exchanges. 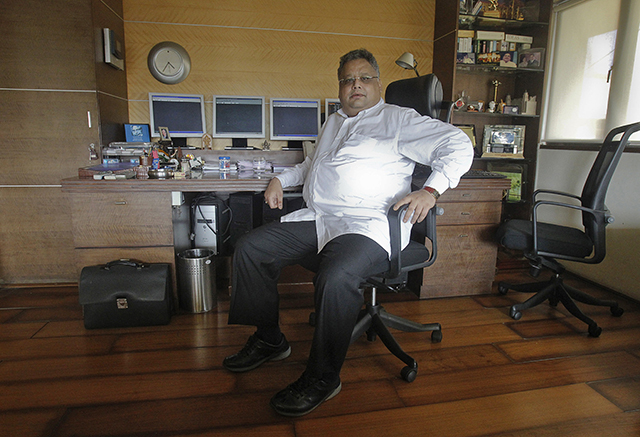 On Thursday, Jhunjhunwala – through his private investment firm RARE Enterprises Pvt. Ltd – acquired 1.25 million shares, representing a 0.54% stake, at Rs 106.54 per share, for around Rs 13.3 crore ($2 million) NSE data showed. Jhunjhunwala, along with his wife Rekha, held 9.74% stake in Delta Corp as on 30 September, which has now become 10.28%. Delta Corp shares last traded at Rs 116.10 apiece on BSE, up Rs 3.43% in a weak Mumbai market on Friday. Jhunjhunwala had initially invested in Delta Corp six years ago and slowly increased his stake over the years. Led by Jaydev Mody, Delta Corp started off as a real estate firm and entered the hospitality and gaming segment in 2008. Currently, the company claims to have three out of the six issued offshore gaming licences in Goa that include Deltin Royale, Deltin JAQK and Deltin Caravela, according to its website. The company claims that Deltin Royale is currently India's largest offshore gaming vessel with 950 gaming positions across 116 tables and 250 slot machines. Besides, the company operates Deltin Suites, a Casino Hotel in Goa. In 2014, Delta Corp launched THE DELTIN in Daman, which it claims to be India’s largest integrated casino resort, located at close proximity along the Mumbai-Ahmedabad route. The Pune hospitality firm had also expanded its exposure to online gaming in August this year with a plan to acquire Gaussian Networks Pvt. Ltd, which operates online poker site adda52.com, in a cash and stock deal that valued the startup at around Rs 182 crore ($27 million). Delta intends to initially acquire a 26% stake in Gauss Networks from the founders for Rs 47.3 crore in cash. Gauss Networks, a software developer and software-as-a-aervice (SaaS) firm, in turn, owns Gaussian, the entity behind adda52 which was founded by IITians Anuj Gupta and Mohit Agarwal. Post the first leg of the transaction, which is expected to be completed by June 30, 2017, Gaussian Networks shall be merged with Delta Corp. Founded by IIT-Delhi alumnus Anuj Gupta, Gurgaon firm Gaussian Network is an online firm that claims to specialise in games like rummy, poker, chess, scrabble, golf and pool, among others. It has products including adda52.com, adda52rummy.com and adda52mart.com to offer online versions of card games and also related products.